I am not prone to bursts of spontaneous laughter–especially at a memory–but one that will always have me laughing aloud is one from many Christmases past. I’m not even sure we have it on video anymore although we did at one time. 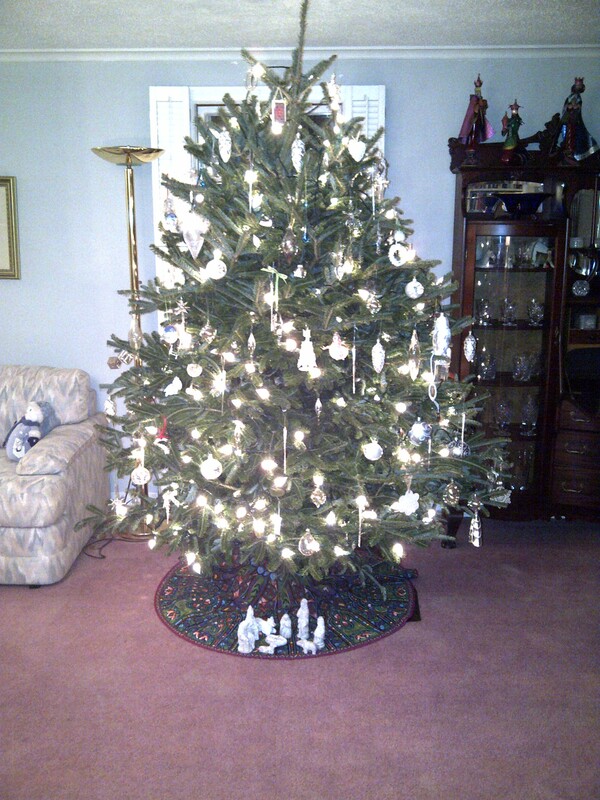 Well, of course only half the tree was lit–and when Dad turned around and saw that, his crestfallen look was priceless! I think that was funnier than the fact that half the lights were out! Seriously though, few things are fraught with more difficulty than acquiring and putting up a live Christmas tree, even if you don’t cut it down yourself (trust me, I’ve done it both ways). I’ve never had quite the trouble Bob Tedeschi portrays in the New York Times, however. Maybe it comes from being a gardener. I have had a tree topple over once, onto a hardwood floor. Somehow, miraculously, not an ornament was broken. But since that time, I use a “backup” system and secure the tree if I’m feeling nervous. It also helps that I use one of the most marvelous stands ever made. It comes in 2 pieces. I think it was originally sold as the “swivel straight” stand. Who knows what it’s called now? The stand wasn’t cheap but it’s worth every penny. There’s a collar that goes around the trunk of the tree while the tree is still outside (at least that’s how I do it). You can secure the tree in this collar while the tree is somewhere that’s easy to work on. Then you bring the tree into the house and place it in the stand. There’s a foot pedal on the stand that allows you to “swivel” the tree into any position to straighten it (hence the stand name). Once you get the tree the way you want it, you lock the pedal in place and the tree is locked in place. I actually push on the tree to be sure it’s secure–several times–before I fill the stand with water. That’s the other great thing about this stand. It has a large reservoir for water so the tree doesn’t dry out. I usually keep my tree about a month. (Of course, in my chilly home, that’s not too much of a problem). And that is my secret for avoiding unpleasant Christmas tree surprises. It also helps that I string the lights while they are lit. No “ta da” moments for me! Next Article And For Your Next Holiday Abomination….